There will be a Boat Fire Safety presentation at the Black Horse, Bath Road, Devizes (between locks 47 and 48 on the Caen Hill flight) this Tuesday 27th November 2018 at 7pm. There will also be one on 4th December 2018 at 6.30pm at the Cross Guns, Avoncliff. Dorset and Wiltshire Fire and Rescue Service will be giving comprehensive advice on how to make your boat as fire safe as possible and what to do in case of fire, including FREE SMOKE DETECTORS AND CARBON MONOXIDE ALARMS!! 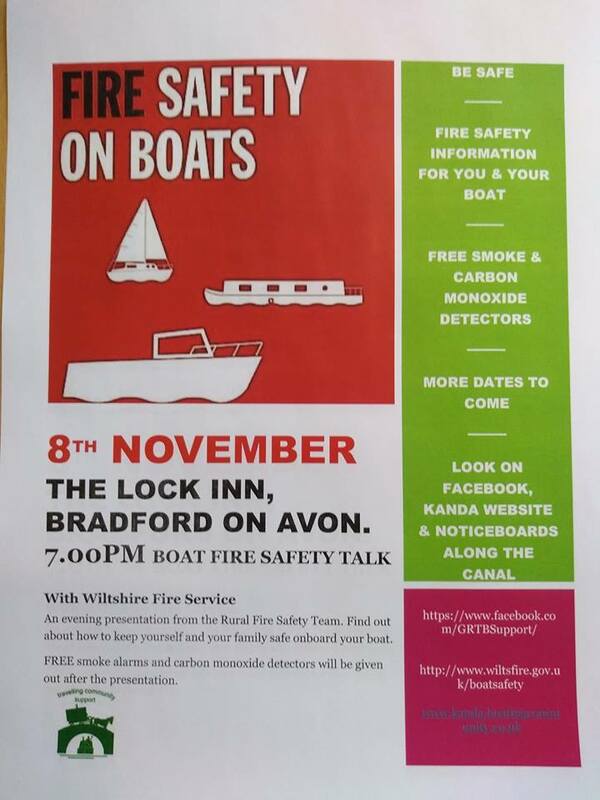 There will be a Boat Fire Safety Talk at 7pm tomorrow, Thursday 8th November 2018 at the Lock Inn, Lower Wharf, Bradford on Avon. The removal of the bins at Darlington Wharf in Bath a month ago has inconvenienced boaters to such an extent that Julian House Travelling Community Support service met with Bath Waterspace Project Co-ordinator Cleo Newcombe-Jones today (15th February 2018) to discuss rubbish bins and overall facilities provision on the K&A within the BaNES Council area. As part of a joint community arts project focusing on mental health, well-being and mindfulness, Julian House Travelling Communities Support Service is holding a number of craft workshops for liveaboard boaters who need support with these issues.